PEO Ammunition adapts new technology to produce improved, more lethal ammunition for 155 mm artillery. Since the 1970s, ammunition improvements for 155 mm artillery systems have resulted in U.S. dominance of long-range artillery weapon systems. But with continuous change in threats worldwide, the rapid introduction of new technology and our adversaries’ adaptations, the U.S. faces new challenges. Defeating large formations of enemy armored vehicles will require new ammunition with improved lethality for 155 mm artillery while minimizing its negative effects on friendly troops and noncombatants. 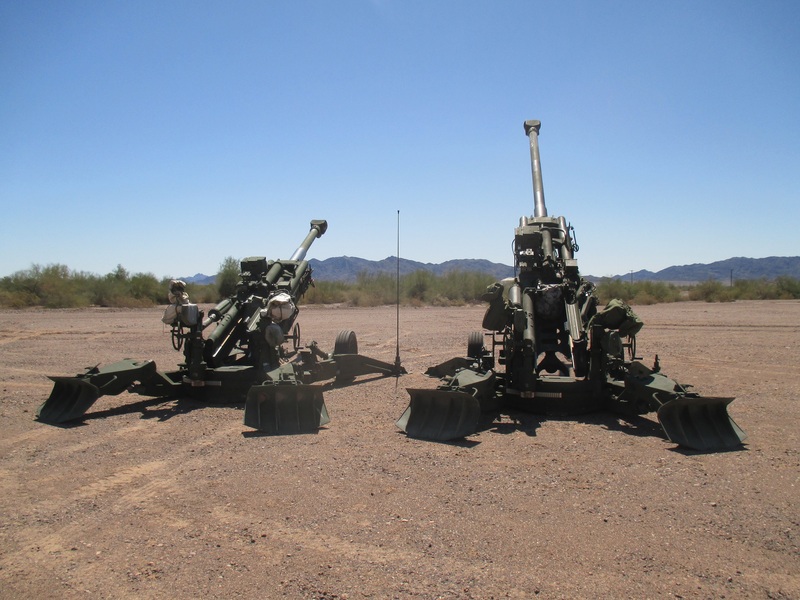 To ensure that 155 mm field artillery keeps pace, the Program Executive Office (PEO) for Ammunition is executing the 155 mm Cannon-Delivered Area Effects Munition (C-DAEM) program, drawing on lessons learned from past efforts and harnessing the best of today’s technology to enable defeat of personnel or vehicles spread over a large area. Such targets, given their ability to move and the large distances between them and U.S. artillery, are defined as “poorly located area targets,” where “poorly” reflects a high uncertainty as to their exact location. An analysis of alternatives (AOA) is underway to model and identify the best solution set of new munitions and, in turn, to inform the requirements of the program’s capability development document. Plans call for engineering and manufacturing development (EMD) to begin in the first quarter of FY21. In the interim, the science and technology community will be testing prototype munitions suitable for firing from 155 mm platforms to demonstrate technology readiness level 6—a significant achievement in the material development process, signifying that a system-level prototype has been successfully demonstrated in a relevant environment and is ready to start EMD. The Army is also executing a bridging strategy to quickly qualify highly mature and off-the-shelf munitions to begin fielding in FY19. From the mid-1970s to the mid-1990s, the Army produced large quantities of Dual-Purpose Improved Conventional Munition (DPICM) grenade carriers. The M483A1 and M864 DPICM carriers would be fired in volleys, and their time fuze would expel the grenades (88 from the M483A1, 72 from the M864) over personnel or vehicle formations to achieve fragmentation and penetration effects upon impact. Although grenades dispensed in large numbers from artillery projectiles or rockets have a very high military utility, rounds now in the U.S. stockpile do not meet the Office of the Secretary of Defense’s goal of less than 1 percent unexploded ordnance (UXO). Their use leaves large amounts of UXO, resulting in hazards to friendly troops later passing through the targeted area and to noncombatants who come across an unexploded grenade on the ground. Future development programs that use this concept of delivering large numbers of grenades must meet the goal of less than 1 percent UXO. In the 1980s, the Sense and Destroy Armor (SADARM) projectile added “smarts” to dispensed cargo with an even more lethal punch. The SADARM projectile contains two sensor-fuzed munitions, which, after expulsion from the carrier, scan the ground during descent for armored vehicle targets. Upon detection, they fire an explosively formed penetrator (EFP) through the target’s roof, defeating the vehicle. In 2007, yet another significant advance occurred with the fielding of the Excalibur projectile. Excalibur is a coordinate-seeking, high-explosive (HE) projectile that uses an onboard GPS sensor to hit targets at extended ranges with accuracy of less than 2 meters’ circular error probable, or miss distance. Finally, the Precision Guidance Kit (PGK), which is a GPS guidance kit with fuzing functions, turned the U.S. supply of conventional HE projectiles into near-precision ammunition. The PGK is placed on the nose of an M795 or M549A1 HE projectile, is programmed with the target’s GPS coordinates and guides itself to the coordinates with accuracy of less than 30 meters’ miss distance. Excalibur and PGK are in full-rate production and have proven to be extremely successful in today’s fight. Develop and deliver new and improved capabilities that will provide highly lethal effects on a wide spectrum of stationary or moving complex target sets (personnel and vehicles), where their exact position has high uncertainty. Provide greater range and lethality to defeat enemy artillery counter-fire. Deliver efficient effects against personnel and light to heavy mechanized vehicles in poorly located and GPS-degraded or -denied environments. Deliver a modernized capability to replace the aging legacy stockpile, with increased reliability that increases effectiveness for our troops while nearly eliminating UXO dangers to friendly forces and civilians. Given that the C-DAEM program may not complete EMD until FY23, the Army has approved a directed requirement to get a capability into the field starting in 2018. To provide an improved replacement capability as quickly as possible, PEO Ammunition’s Project Manager for Combat Ammunition Systems, headquartered at Picatinny Arsenal, New Jersey, is executing a bridging strategy to accelerate the development of the U.S. Army’s XM1128 extended-range HE projectile, to procure the BONUS SFM round from Sweden and to qualify the M999 grenade-carrying projectile from Israel. The XM1128 projectile is in its final stages of technology development and is more lethal than the current HE family at longer ranges (18 miles). The BONUS SFM is similar in concept to the U.S. SADARM, has been qualified by the U.S. Army and is in production. It has two submunitions with advanced sensors and is designed to defeat heavy target sets. After ejection from its artillery shell over the target area, each submunition independently searches for armored vehicles, and upon detection, fires an EFP through its roof to defeat the target. The M999 contains improved conventional munitions (tailored to defeat personnel and light targets), and is designed to meet the UXO threshold of less than 1 percent. Together, these three new munitions for the U.S. Army’s inventory will provide near-term capabilities while the C-DAEM is in its early development stages. ARDEC is developing several concepts to defeat personnel and vehicle targets spread over a large area as part of the Cluster Munition Replacement Technologies (CMRT) science and technology program. CMRT delivers area effects on poorly located area targets, ranging from personnel light targets to medium mechanized targets. PRAXIS is an improved conventional munition that dispenses four full-bore submunitions. Each submunition is equipped with a highly reliable, tri-mode fuzing system, with pre-formed tungsten fragments in the warhead. Another concept, resembling the legacy DPICM munitions, is the DPICM XL. 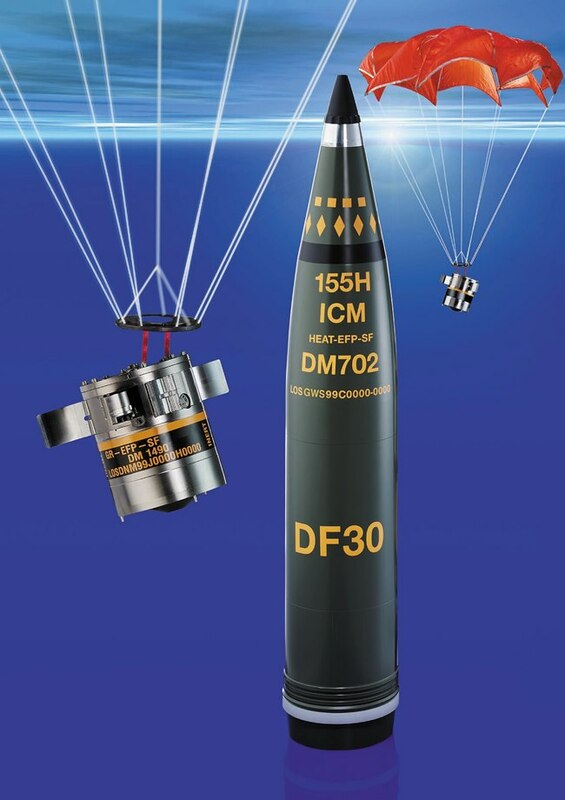 This munition contains 60 submunitions, each equipped with a high-reliability fuzing system with redundant systems to ensure it detonates as planned. Target sets include personnel, light materiel and up to medium armored targets, accomplished with an advanced warhead designed to penetrate the skin of an armored vehicle. Both PRAXIS and DPICM XL are designed to meet the policy of less than 1 percent UXO. To address extended range capabilities, ARDEC is developing a rocket-assisted projectile that is capable of attaining ranges as far as 24 miles from the U.S. Army’s 39-caliber weapon system, the XM1113. With lethality equal to the legacy M549A1 but exceeding its range by at least six miles, this projectile is under consideration as part of the C-DAEM suite of munitions. It contains a single warhead that will not leave behind submunition UXO. For improved accuracy, the program is working to obtain compatibility qualification with the PGK fuze. The Office of Naval Research (ONR), working with Naval Sea Systems Command, is also developing its own concept for area effects: the High Reliability DPICM Replacement (HRDR). HRDR is a cargo projectile, similar to DPICM XL, that addresses area effects and poorly located targets with a large number of submunitions. Each submunition will be highly reliable and outfitted with advanced electrical fuzing technologies, designed to exceed 99 percent in compliance with the U.S. UXO policy. Industry has offered several concepts for the C-DAEM program, including advanced unitary warheads that would not create submunition UXO. Orbital ATK Inc.’s Lethality Enhanced Ordnance concept uses a noncluster munition concept warhead inside a 155 mm projectile. Raytheon Missile Defense has various concepts, leveraging fielded 155 mm Excalibur variants. Foreign concepts under evaluation include SMArt155, a German sensor-fuzed munition that is similar to BONUS MkII and SADARM. SMArt155 is able to engage and defeat poorly located heavy armor targets using two EFP submunitions. Each submunition uses both infrared and millimeter-wave radar systems to locate targets and contains two seekers, enabling operation in heavy countermeasure environments. Similar to BONUS, SMArt155 has been previously evaluated and demonstrated in U.S. Army 39-caliber weapon systems. 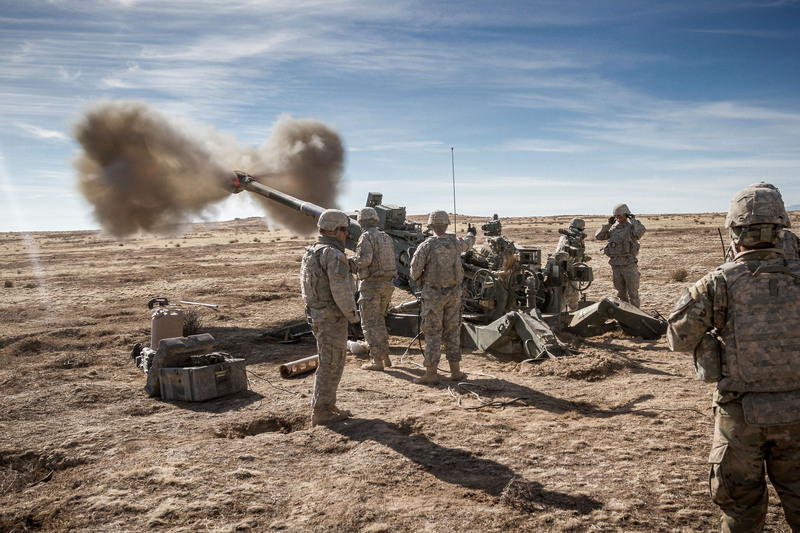 U.S. Army Soldiers assigned to 1st Battalion, 37th Field Artillery Regiment, 2nd Infantry Division Artillery, 7th Infantry Division fire an M777 towed 155 mm howitzer at Orchard Combat Training Center, Idaho, Oct. 12, 2016. The Soldiers are part of a task force of over 1,000 7th ID Soldiers participating in Raptor Fury, a major training exercise to validate 16th Combat Aviation Brigade’s mission readiness. Artillery, the king of battle, will soon have modernized assets that will perform effectively in longer-range missions, with increased lethality. New and improved munitions within the C-DAEM portfolio will offer versatile artillery capabilities to combat both near-term and future engagements with precision area effects and against capabilities from personnel to heavy armor. Overall readiness will be improved with newer munitions that offer increased reliability over the legacy cluster munition stockpile. PEO Ammunition is actively working with industry, government science and technology centers and foreign partners to quickly field combat multipliers to maintain U.S. dominance for indirect fire for decades to come. For more information, go to http://www.pica.army.mil/peoammo/; https://picac2cs9.pica.army.mil/pmcas/ or http://www.ardec.army.mil/. PETER BURKE is the deputy project manager for combat ammunition systems under PEO Ammunition. He is a graduate of the Harvard Business School’s General Management Program, and he holds an MBA from the Florida Institute of Technology and a B.S. in industrial engineering from the New Jersey Institute of Technology. He is Level III certified in program management and in engineering, and is a member of the Army Acquisition Corps. TARA SARRUDA works for the Cannon Artillery Division at ARDEC, serving as chief engineer for the C-DAEM program. She holds an M.S. in mechanical engineering manufacturing systems from Stevens Institute of Technology and a B.S. in mechanical engineering from Lafayette College. She is Level III certified in systems engineering. This article is published in the October – December 2017 Army AL&T magazine.